What kind of Window Treatments Are In? Window treatments are an important component in your home and offer a touch of style to your interior design. They offer aesthetic appeal to your home, but they also block and control UV rays thus impacting your heating and cooling costs. Window treatments also offer needed privacy in your home as well. 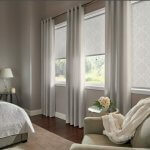 Today we are going to look at what kind of window treatments are currently in style. These contemporary type of window shades are the most energy efficient of all our shades. They have a honeycomb design of individually shaped “cells” that create air pockets. Since the air is trapped within these pockets it creates a layer of insulation for your home. Cellular shades come in both single and double-cells and have opacities ranging from sheer to blackout. They also fold up along crisp pleats when not in use. Naturally woven shades are made from eco-friendly sustainable materials such as bamboo, grasses, and reeds. They offer organic textures and design to your windows. The asymmetrical nature of the materials used to create these shades add a touch of an earthy and relaxing atmosphere to your living space. As a bonus, privacy liners can be added as requested. If you are looking for a modern and understated elegant shade to add to your office space or home environment, you should consider Roman Shades. They come in a variety of fabrics and naturally woven materials and can be created in a flat or traditional Roman fold. The Roman Fold feature is a top down bottom up style and they can also be motorized. When not in use they rise into soft perfect folds. Privacy liners can also be added to these shades for a blackout effect. Shutter window treatments are the only ones that add value to your home. They are timeless and never go out of style and fit into many different types of interior design. They have no cords, strings, or fabric that could be tangled and are very easy to clean. Shutters also regulate light exceptionally well and can be custom made to fit any type of window style. These shades are not designed for completely blocking out light, but rather reducing glare and reducing infrared heat gain. Yet, they still allow you to view through them to see the outdoors. Installing solar shades greatly increases the energy efficiency of your heating and cooling system. They operate on a roller system and are perfect for rooms that have a stunning outdoor view you don’t want to impede. Made 4 U Shades also offer an outdoor version of solar shades. Wood as a material never goes out of style and wooden blinds are no exception to this rule. Wooden blinds are sleek and sturdy and come in an assortment of stains and colors. If you are looking to add a touch of warmth to your living space, consider these blinds. Wooden blinds are also durable, sturdy, easy to clean, and are the perfect complement to log homes. Regardless of the type of window treatment, you choose for your home or office space they reflect your personal style and taste. When choosing a treatment to make sure to take into consideration the type of furniture you have in the room and effect you are trying to achieve. Well chosen treatments blend in seamlessly with the room’s environment. There are a plethora of options to choose from to suit everyone’s needs as we just discussed. You do not have to be stuck with a simple white Venetian blind from your local department store. Made 4 U Shades Blinds & Shutters is always here to help you professionally select the best window treatments for your home. Contact us today for a free estimate and we will bring samples and measure for you!